Total hip replacement (THR) is reserved for animals that have painful conditions of the hip joint that have proved poorly responsive to conventional management using pain relief and rehabilitation. Dogs with advanced osteoarthritis or dysplasia of the hip joint may in some cases benefit from replacement of the hip joint. Total hip replacement is an advanced surgical procedure and should only be performed by experienced orthopaedic surgeons. Total hip replacement is considered a routine surgical procedure performed by our orthopaedic surgeons based on tried and tested implants. What does THR surgery involve? Currently we are one of a few practices in Australia able to provide total hip replacement surgery routinely and we offer a number of different types of hip replacement prostheses. Total hip replacement involves replacing the entire hip joint surface. The procedure involves removing the femoral head from the top of the femur, also referred to as the ‘ball,’ and replacing it with a metal ball (cobalt chrome). The acetabulum of the pelvis, also known as the ‘socket’ is resurfaced using a ‘cup’ implant to provide a seat for the new femoral head to sit in. The implants can be attached to the bone using bone cement, or may have a porous coating into which the bone can grow. To perform surgery, a vast surgical team is required. A bilateral BFX system hip replacement demonstrating the implant components - an acetabular , femoral head and femoral stem. Patients with painful hip disease which is non-responsive to medical therapy. This can be due to hip dysplasia causing arthritis, recurrent dislocations (luxation), fractures, developmental disorders (avascular necrosis) and failed FHO procedures. Our surgeons will need to evaluate your pet fully prior to considering them a suitable candidate. We will also need to talk through the potential risk and benefits prior to deciding to proceed. What is the cost of THR? We currently offer a fixed cost for a single uncomplicated hip replacement - $7500. This includes consultation, radiographic assessment, surgery, hospitalisation and routine follow up appointments. As this is an act of veterinary surgery, only a veterinary surgeon can perform this. However, this is considered a specialist procedure and as such only certain vets will undertake this technique. This is a technically very demanding procedure and should only be performed by experienced and ideally specialist orthopaedic surgeons. In our clinic, Dr Beierer and Dr Beck perform this surgery as a team. Having two surgeons performing the procedure gives 2 pairs of highly experienced eyes which leads to a successful outcome in the majority of our patients. Are there different types of THR? There are two main classes of THR technique, those using bone cement (cemented) and those that rely on other means of fixation (cementless). Different manufactures have developed numerous systems for performing veterinary THR. At QVS we use the BioMedtrix THR system. This product has been on the market since 1990 and is therefore the most widely studied. Currently, there is no scientific consensus as to which is the favoured technique, cemented or cementless. We have the availability to perform both techniques and which is used is decided on a case by case basis. A cemented CFX femoral implant with a BFX acetabular cup. This is termed a 'hybrid' replacement. 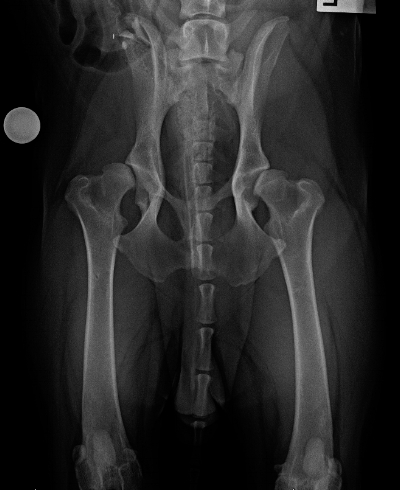 Does my pet need both hips treating? Although the disease may be present in both hip joints, some patients will only require the procedure performing in one joint to significantly improve their quality of life. Others will need both hips replacing but this will be discussed at the time of consultation. What is the outcome after THR? This can be a life changing procedure, bringing comfort and improved mobility in many patients. The success rate for THR is approximately 90%, and most patients are more comfortable within a few days to weeks of surgery. We expect most patients to return to full activity assuming there are no complications. What are the potential complications with Total Hip Replacement? The major complications encountered with total hip replacement are dislocation of the hip joint in the post-operative period, fracture, implant loosening or infection. Infection is a rare but potentially devastating complication of any surgical procedure and we take every possible precaution to try and prevent the patient developing an infection. The risk of loosening is also rare. What is the typical recovery after Total Hip Replacement? Careful rehabilitation after total hip replacement is the key to success and it is vital that patients who undergo this surgery are managed diligently for the first 14 days after surgery to prevent damage to the operated hip. Exercise is progressively increases until off-lead exercise by approximately 6-12 weeks. Patients will remain hospitalised for between 1-4 days post operatively depending on comfort, mobility and temperament. Once they are ready for home management, a dedicated rehabilitation and activity plan will be put in place. Are there alternatives to THR? There may be certain situations where THR is not a viable option such as for financial reasons or variations in individual anatomy that preclude THR. In this case, Femoral Head Ostectomy (FHO) could be pursued. This procedure involves removal of the hip joint and a false hip joint is allowed to develop from scar tissue. Most patients undergoing this procedure will be left with a limp or gait abnormality but pain relief is usually satisfactory to improve the quality of life. Physical therapy (hydrotherapy and physiotherapy) can help maximise limb function for these patients. An example of an FHO hip (left side) and a very dysplastic opposite hip before THR surgery. The above example after a hip replacement whilst the FHO side can be seen with significant distortion of the joint.